The earliest surviving sculpture in Sutton, and probably the most spectacular, is the effigy of Bishop Vesey on his tomb monument in the Parish Church. It is the only monumental effigy of a bishop in Warwickshire, and was probably sculpted from life, as the vestments of a bishop had changed by the time of his death in 1554 from those worn by the effigy. The tomb monument dates from 1875, when Sutton corporation renovated the statue - it had previously been in a niche in the wall. Also in the church is the only statuary in Sutton by Sir William Wilson, the busts of Henry Pudsey and his wife Jane, dating from the 1670s. Jane was soon widowed, and married William Wilson, “the comely and clever young sculptor of the elaborate monument of her first spouse”. The carved urns which once adorned Sir William’s Moat House in Sutton have all gone, but his statuary can still be seen at Sudbury Hall, Castle Bromwich Hall and in Sir John Moore’s School at Appleby Magna. Our native sculptor, William Woodington, is represented by a statue, now at Holland House School, of a young boy looking sad, dating from about 1890. More cheerful children from the 1980s, Roller Skaters and Fiona with her Great Dane, used to be in the Mall but are now to be found in the grounds of Springfield School. Another child in bronze, shown being taught to swim, is the subject of Benjamin Cresswell’s 1920 war memorial for the members of Boldmere Swimming Club who died in the first World War, now in the entrance to Wyndley Swimming Baths. A statue of a common soldier in full kit is the subject of our main was memorial in King Edward Square, by Francis Doyle-Jones. A sculpture by Graham Jones in Sutton Park marks a happier occasion, the designation of the Park as a National Nature Reserve in 1997. 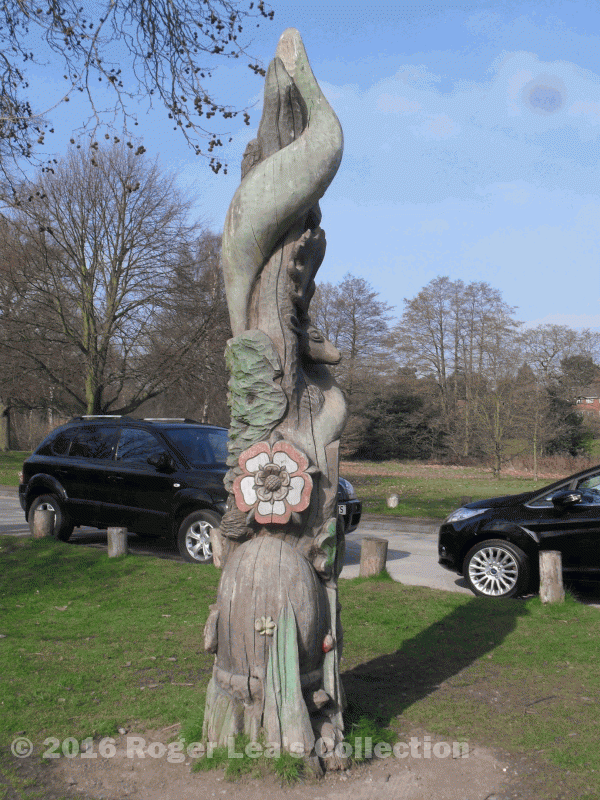 Carved from a single piece of oak 3½ metres high, it depicts the wildlife of the Park entwined by new shoots springing from a giant acorn, promising a hopeful future. 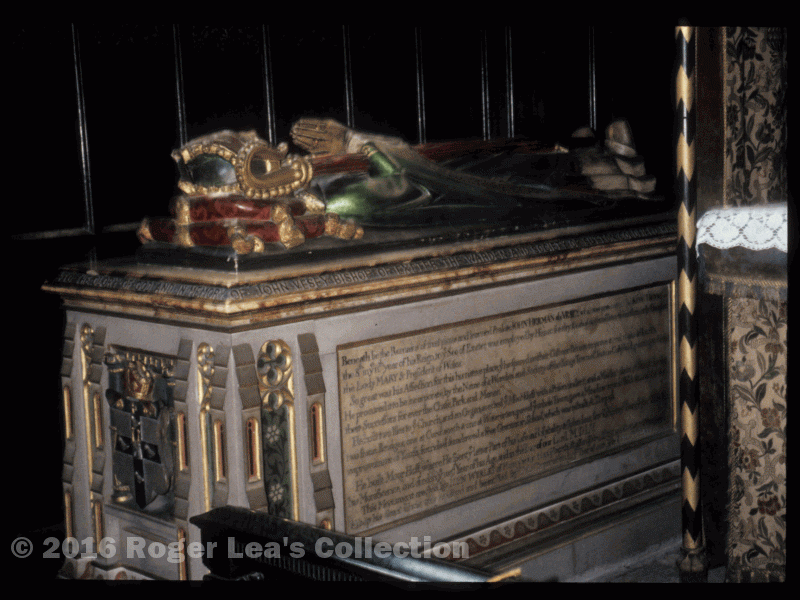 Bishop Vesey lying with his head on red cushions in the Vesey Chapel of Sutton Parish Church. Totem Pole sculpture by Graham Jones near the town gate entrance to the Park.